On Saturday 8th June why not join our #PopUPCraftivist in New York City for a FREE craftivism session or just a chat anytime between 2pm-5pm in Union Square. If it’s sunny we will be outdoors in the square opposite Barnes & Nobles main entrance on the chairs and tables in the square. If it’s raining we go for Plan B indoors: and be in the upstairs Cafe of Whole Foods Market, Union Square which is 4 Union Square South). Pop up shops are soooo last year. This June New York City has its very own pop up craftivist: Me (Sarah Corbett, Founder of Craftivist Collective) will be with my little suitcase of craftivism hanging out in Union Sqaure with a smile (and secretly very nervous!) hoping you & your friends will join me. Look out for me and come join me in some crafty activism or just chat to me about the history and benefits of craftivism. 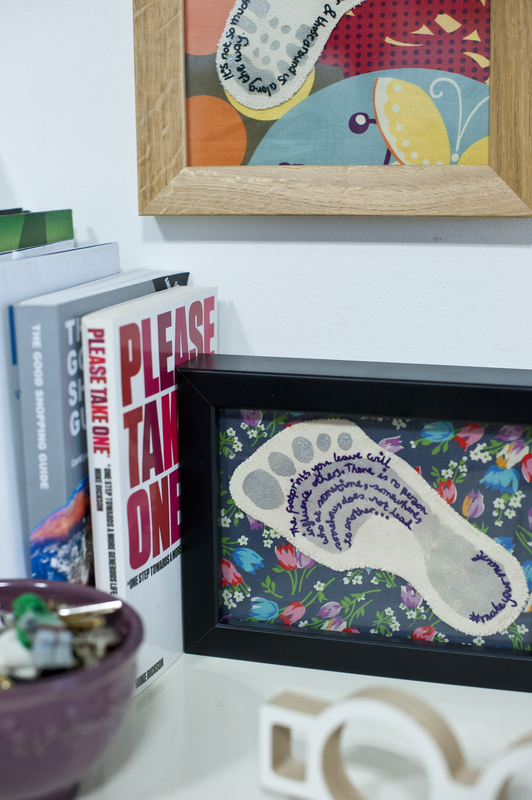 Get a free tutorial to go with your free craftivism footprint resources and join in the free footprint activity below. I’m a nice craftster, I promise! What’s with the fabric footprints? Well… in the busy world we live in it’s easy to forget to make time & space to reflect on social justice, the impact we are having on the world and what we hope to do in the future to help or at least not harm others. We live in a messy world and can easily take a step onto the wrong road and follow the wrong path. For this activity please thing about the imprint you are leaving on this world. That might be the journey you are on as a global citizen, your carbon footprint, putting yourself in someone else’s shoes and the struggles they may face or how you are going to walk the walk not just talking the talk about social justice. Ha, I like the pop-up craftivist idea! The suitcase is very cool. Hope plenty of New Yorkers come and join you!